Madonna and Monica Belluci swear by this machine and so does Shah Rukh Khan. And there’s no denying that those women (and the guy) are rather fit.We met up with Guus Van Der Meer, the man who invented the Power Plate,to find out how to use it for best results. Guus Van Der Meer is supremely fit—not like soccer coaches or some fitness trainers we know who whip others into shape but look hopelessly out of shape themselves. It reassures us that this man knows a thing or two about fitness. He is 47, is over six feet tall and you can almost feel the toned body under his brown T-shirt. Can the Power Plate, a seemingly innocuous looking machine, make us look as cool as this guy? We meet him over a “healthy drink” at Hotel Park Royal Intercontinental in Delhi to find out more about his machine, which promises a total body workout in 20 minutes. 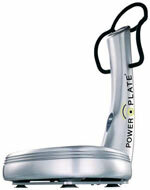 What’s different about the Power Plate? we ask. “Well, in short, it’s a machine that gives your muscles a total workout by using vibrations to stimulate and contract them. By standing on the Power Plate, you will notice how your body automatically adjusts to the vibrations. The mechanical stimulus produces a stretch reflex, which, depending on the selected frequency, results in muscles vigorously contracting 30-50 times per second,” he rattles off. Wow, that’s a lot of jargon. But, can it be used by, well, almost anyone? With the Acceleration Training method, it is possible to enjoy training effectively without overloading the body and its joints, assures Van Der Meer. “The Advanced Vibration Technology in the Power Plate actually increases the production of regenerative and repair hormones, improves blood circulation and strengthens bone tissues. This results in more strength, speed, stamina and increased flexibility,” he says. And, yes, training with the Power Plate is suitable for everybody from high-performance athletes to those on the wrong side of 50 and definitely those simply wanting to improve their general fitness levels. But what about the average guy who can’t remember when he last worked on his stamina, strength or flexibility? In other words, how should a beginner use the machine? Van Der Meer smiles: “Over the years, we have developed a special training programme that we call the ‘Adjustment and Adaptation’ schedule. This allows anyone who is just starting out on the Power Plate to slowly get used to the effects of this training method. We believe this is important, because Acceleration Training is a different kind of exercise, and your body will need some time to adjust to this new form of stimulation. On average, this will take about three weeks, assuming you are planning on two training sessions per week,” he says. Cool. We are all set to give it a go. Are you? I tend to get up quite early in the morning.I don’t exactly have a fixed diet, but I have six small meals a day that are high on protein and low on carbohydrates.I train three times a week, performing a variety of exercises on the Power Plate in order to ensure a total body workout, which takes about 20 minutes. For many exercises, I use additional weights in order to make them even more effective, as I am an advanced user and in order to achieve results, it is necessary to progressively stimulate the body over time.